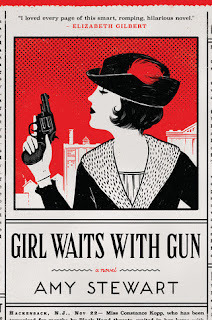 I thoroughly enjoyed Girl Waits With Gun. This historical mystery set in 1914, features the Kopp sisters, each one of them a force to be reckoned with all their own. It was hard for me not to set aside my particular interest in this novel because of its roots. It's based on the real life Kopp sisters, one of whom becomes one of the first female sheriff deputies in the country. It made the events that played out in Girl Waits With Gun all the more intriguing to me. Author Amy Stewart does take some liberties with history, which she spells out at the end of the book. Even so, I am in awe of Constance Kopp and am glad Stewart made her the focus of her novel. Much of the events described are taken straight out of the headlines. I would love to have been the author's research assistant for a book like this! Constance Kopp and her sisters have lived a quiet life. Their mother had never been particularly trusting of the government or the authorities, and as a result. neither had the Kopp children. Their older brother, Francis, lives in a nearby town with his wife and children. He often worries about his sisters, living on the farm all by themselves. They live in a time before women have the right to vote and men are responsible for their women kin. Constance, Norma and Fleurette are all very independent and have been for quite some time. Constance and Norma may not always agree, but they are determined to take care of sixteen year old Fleurette on their own and protect her from the dangers of the world outside. Their relative obscurity is destroyed when their buggy is hit by the automobile of a factory owner, Henry Kaufman. Constance's simple request for payment got unmet, and when she confronts him in person, he takes offense and decides to make an example of the Kopp sisters. Bricks through windows and threatening notes put the sisters on edge. The local sheriff does what he can to help, knowing what a no good person Kaufman is, but his resources are limited. During her visit to the silk factory to visit Kaufman, Constance encounters an employee of Kaufman's who begs her for her help. Constance doesn't believe she can help, but eventually she finds herself in the middle of that mystery too, despite her sister Norma's reservations. I loved Constance's grit--and Norma's too. Both women are forces to be reckoned with. I imagine Fleurette will be too as she grows older. She may like her pretty dresses and putting on a show, but she was raised by two very capable and resourceful women. She's already got a big heart and good eye for right and wrong. I found this book to be quite entertaining and especially intriguing because of its basis in fact. I hope the author has more adventures planned for the Kopp sisters. I cannot wait to read more about them. To learn more about Amy Stewart, and her book, please visit the author's website. Source: Review copy provided by the Publisher via NetGalley for an honest review. Whilst I am not altogether sure that Amy Stewart's choice of genre is one for me, I nonetheless love the cover art of 'Girl Waits With Gun' and spent quite some time checking out Amy's website and another interesting independent article I found, about the research into this story and the story behind the real Kopp sisters. Yvonne - I was quite taken with the cover too. I had never heard of the Kopp sisters before reading this book and can't help but dig more into their history. Melody - I enjoyed it quite a bit and I hope you will too, Melody! This is the second review I've read of this book and both of them have been positive. It sounds like I need to read it! Kathy - I think you might like this one, Kathy. I hope you will give it a try! Loving the cover but alas like Yvonne I'm not altogether sure this appeals to me either. I hadn't heard of the Kopp sisters but this sounds like a great read! I love historical fiction, historical mysteries and characters with lots of grit. Plus the cover is eye catching! I like that the author explains the liberties she took at the end. When I'm reading a historical novel about something I don't know much about I can sometimes waste a lot of time wondering about what is real and what isn't instead of just focusing on the story itself. Katherine - Women's history is a particular interest of mine, and it's always fun to read about women who break out like Constance does. This one sounds like excellent reading. I'm slapping it right onto my wish list! Thanks for the great review! Megan - I hope you will enjoy it when you read it! This sounds quite different. I love that cover, too. Ti - It was a bit different, but so interesting. I really like the cover too. I love the sound of this one! Can't wait to check it out for myself! Samantha - I hope you do read it! It's so good. I like the sound of this one. Constance and Norma sound like strong characters and the setting sounds good too. Great review! Naida - Constance and Norma were wonderful women--so independent and strong during a time when women took a more backseat role. I cannot wait to read this one. I just got a copy from NetGalley, so I am excited! Athira - I hope you enjoy it as much as I did.